Celebrate Valentine’s Day Weekend 2017 in Classic Elegance at the Beaumont Inn with this special package. As you settle in, you’ll notice your Voucher for the AJ’s Men’s Products sold in the Beaumont Inn Gift Shop, Bourbon Chocolates, 2 Custom-Made Old Owl Whiskey Glasses, and the treat of the night – the Voucher for your 4-Selection Bourbon Flight to be enjoyed before or after dinner in either the Old Owl Tavern or the Owl’s Nest Pub. You’re on your own for dinner on Friday in any of our dining facilities. After your Full Southern Breakfast on Saturday morning, head out and enjoy all that Central Kentucky has to offer or call to check our Bell Cottage Spa availability. 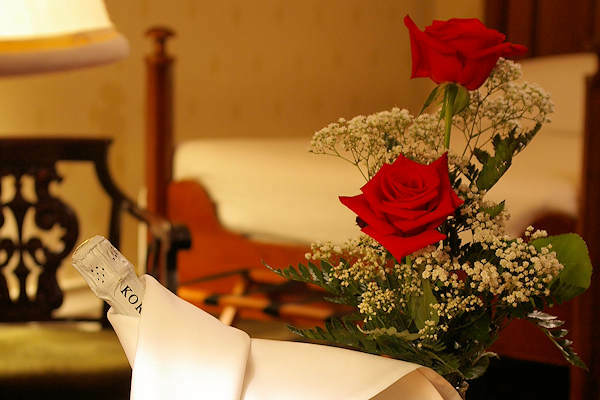 While you’re away, our Valentine’s fairies will deliver one dozen beautiful red roses, one dozen chocolate covered strawberries, and one deliciously chilled bottled of sparkling wine to your room. Enjoy some bubbles and strawberries as you prepare to enjoy your Four-Course Valentine’s Dinner prepared by Chef Brian and his team in the Classic Beaumont Inn Main Dining Room. See menu below. Enjoy a night cap or head back to your room to polish off the bubbles and be with your Valentine. Another full Southern breakfast will await you on Sunday morning before heading back to reality! For reservations and questions, call 8 a.m. to 10 p.m. EST: 1-800-352-3992 or 859-734-3381. Call 1-800-352-3992 or 859-734-3381 for dinner reservations.